Once we receive your application we will acknowledge receipt of your application. This will be done by e-mail (where an email address has been provided), or alternatively by post. We will then check all details submitted to ensure the application includes all the relevant information. Delays may occur if all of the relevant information is not submitted or is inaccurate. Therefore please refer to the local and national validation documents. The publicity requirements document provides information on how we publicise applications. If you are using an architect/agent and they are named as the agent on the planning application form, all correspondence will be sent to them. If you wish to check on progress of your application please enter your planning application reference number to the planning explorer. 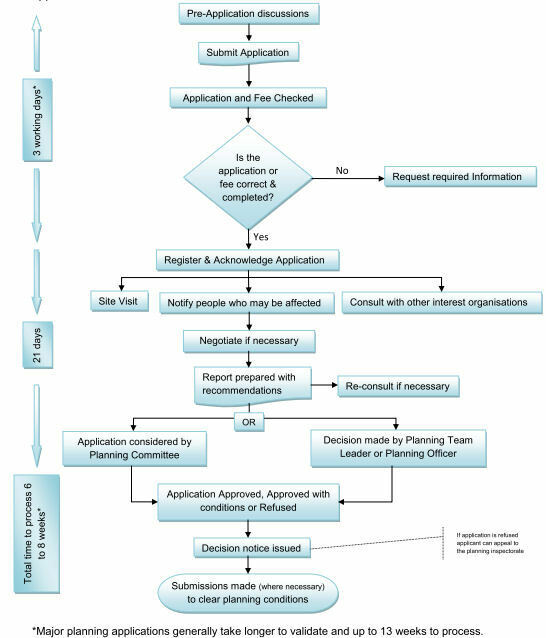 If during the application process the officer considers that the scheme submitted isn’t likely to gain approval, if amendments can be made in order to receive a favourable decision the officer may contact you to discuss amendments to the application or suggest withdrawal of the application to agree a way forward. A fee was paid on the original application. The site area outlined in red is the same (additional land can only be added for access purposes). The description of the development should be the same as the original application. The application is to be submitted as valid within 12 months of the original decision or 12 months of the valid date for withdrawals. Only one exemption can be claimed. The planning committee is responsible for making decisions on the more sensitive applications and those which are outside of the delegation agreement. The delegation agreement allows planning officers, the team leader or the planning manager to take decisions on certain applications without the need to be decided at planning applications committee. The majority of decisions we issue are delegated decisions. The powers and functions of the planning applications committee, as listed in the council’s constitution and defined under the Local Authorities (Functions and Responsibilities) (England) Regulations 2000, as amended, may be discharged by the head of regulatory services or the planning manager or other officers authorised by them. in the view of the head of regulatory services or the planning manager an application is of significant public interest, and/or is believed to be controversial. Who may speak at committee? the applicant or his agent. Each speaker will be allowed three minutes in which to put their case. If more than one member of the public wishes to speak, either for or against an application, then speakers will be allocated on a first come first served basis. It is therefore important that if you receive a letter and wish to speak, you must contact the council as set out in the letter, by 5.00pm on the Thursday before the meeting (in order to give equal opportunity, only telephone bookings will be accepted). If more than one speaker does come forward, you are strongly advised to contact the other objectors or supporters and agree a spokesperson. A ward member is entitled to speak for any length of time at the chairman’s discretion and will be allowed to enter into the debate, but not to vote. Public speaking is only allowed for planning applications on the agenda. Each speaker is allocated three minutes in which to put their case – public speaking will commence after the officer has introduced the application to members. The chairman will firstly introduce the speaker, let the speaker know when the two minute mark has been reached, and after three minutes the chairman will thank the speaker and ask them to return to the public seating. There will be no further opportunity for involvement for speaking or involvement in the debate which follows the public speaking. If you are notified that you are included on the schedule of public speakers, you should arrive fifteen minutes before the meeting commences and introduce yourself to the committee clerk, who will explain the procedures. If you are not present when the chairman asks you to speak you lose your opportunity to speak. planning policy (local policy, structure plan, regional spatial strategy and government guidance). developer’s morals / motives etc. interrupt other speakers, or the committee debate. If this does occur the chairman can curtail your right to speak, and in serious instances the chairman can ask you to leave the room. Your presentation will be verbal only – no other form of presentation will be allowed (including the passing out of photographs, or handouts). Members of the committee, through the chairman, may ask questions of clarification from a speaker, but debate at this stage is not allowed. Applications are normally dealt with in the order in which they occur on the agenda, although the chairman may take them out of order if large numbers of people attend for a particular item. The chairman also has the discretion to vary procedures as necessary to assist the conduct of the meeting. If the application is deferred to a later meeting, those who spoke first time around will have an automatic right to speak again, or may nominate someone else to speak on their behalf, but must confirm their wish to speak again following receipt of the letter from the council prior to the relevant meeting. If no response is received, the invitation will then be extended to others who have made written representations and requested to speak. Following the completion of the public speaking the chairman will invite members to debate the application, and where appropriate request clarification from officers. Each committee member has a single vote, with the exception of the chairman who can vote a second time (a casting vote) if members are evenly split when they vote. The planning committee is usually held on a Monday at 2pm and takes place every four weeks at the Town Hall, King Edward Place, Burton upon Trent, DE14 2EB.